Test your knowledge of population data! How close can you get to a perfect score of 63? Mouse-over results for the latest population estimates. Test your knowledge of population data! Start by choosing your geographic level: metro areas or states. Click on the name in each match-up that you think has the larger population. Green shows a correct answer, red indicates an incorrect answer. When you have opposing names picked for the next round, pick again. How close can you get to a perfect score of 63? When you are finished, play again or mouse-over results to view the most current population estimates for each pair. 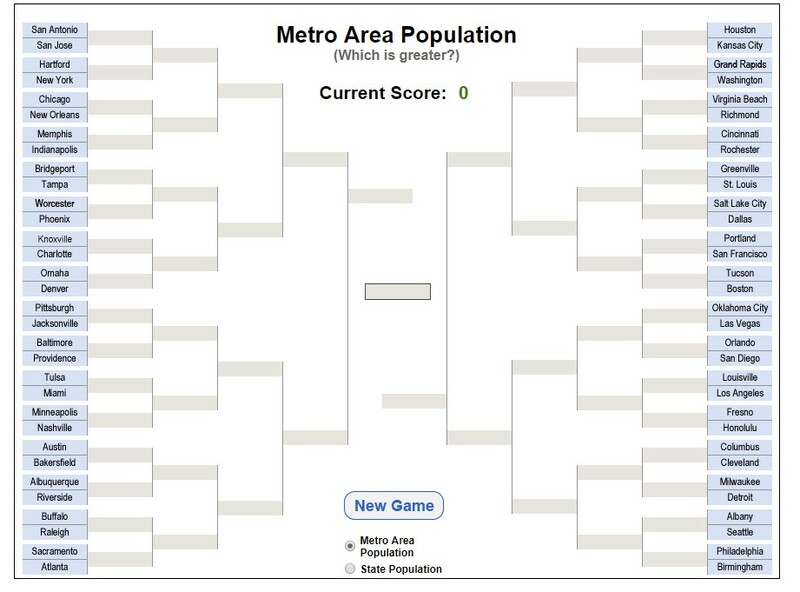 Winners in each metro area match-up are based on a comparison of the July 1, 2017 population estimates. Metro areas included are the 64 most populous (based on 2017 population) in the 50 states and District of Columbia. 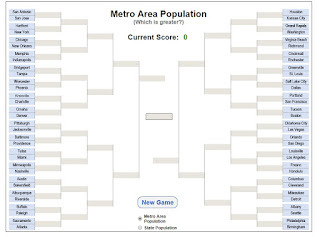 Help us spread the word about the Census Bureau's Population Bracketology game! We're here to help you get the most out of Census Bureau data. If you have a question, visit Ask Census.gov or give us a call at 1-800-923-8282 (TTY 1-800-877-8339). You can also connect with us on social media. This is an official email from the U.S. Census Bureau. If you have any questions or comments, please contact us (https://www.census.gov/about/contact-us.html).